Def Leppard played the second show of the 2013 VIVA Hysteria! residency last night at The Joint in Las Vegas, NV with 21 songs played. Night two of the 11 date run saw the band play a shorter 7 song opening set as "Ded Flatbird". Tonight's set had 6 changes from night 1 with 'Foolin' kept in. Notable additions included the excellent opening of 'High 'N' Dry', 'Action', 'Another Hit And Run' and 'Too Late For Love'. Not bad for an opening band. The intermission remained the same with band interviews and the Steve Clark tribute video shown. These are actually projected onto the curtain in front of the stage with the roadies working behind it. The black curtain is then used before 'Hysteria' starts with album art projections displayed. The band played the full album once again and ended with the same encore of 'Rock Of Ages' and 'Photograph'. Something you may have noted having now seen video footage is that the band are playing versions that are extremely faithful to the original album (as stated in interviews). 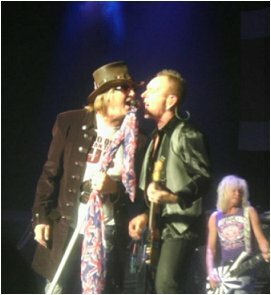 Sound effects from the album are used with Rocket being especially different to previous live versions. Also of note is how good the 3 rare Hysteria songs sound!.